ISLAMABAD: National Accountability Bureau (NAB) Chairman Justice Javed Iqbal Monday chaired a high level meeting to review the performance of operations and prosecution divisions of NAB. He directed the operation division to complete the complaint verification, inquiries and investigations in accordance within the prescribed time frame of 10 months on the basis of solid evidence as per law, said a press release issued here. NAB chairman directed NAB Lahore to complete 161 inquiries, 47 investigations, NAB Karachi to complete 173 inquiries, 119 investigations, NAB Khyber Pakhtunkhwa to complete 105 inquiries, 26 investigations, NAB Balochistan to complete 85 inquiries, 23 investigations, NAB Rawalpindi to complete 102 inquiries, 40 investigations, NAB Multan to complete 18 inquiries, 13 investigations, and NAB Sukkur to complete 95 inquiries and 20 investigations within the prescribed time frame. 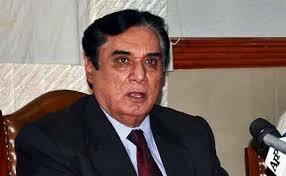 The NAB chairman said that eradication of corruption is the voice of the whole nation. “NAB officers are putting their best efforts and energies together for elimination of corruption from the country across the board as per law,” he said.